BATON ROUGE, La. - It was one last chance to fine tune their skills on the track before the championship portion of the schedule and the Tulane track and field program took full advantage of their opportunity by setting nine personal records at the LSU Twilight meet hosted at the Maddox Field House. 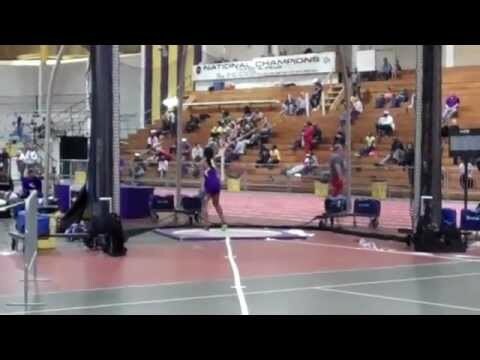 BATON ROUGE - Perhaps no athlete in the NCAA has displayed the level of consistency and improvement during the 2012 indoor season quite like Lady Tiger sophomore Denise Hinton as she threw a new personal best in the weight throw for the sixth-straight meet while shattering her own school record during Friday's LSU Twilight at the Carl Maddox Field House. HAMMOND – Southeastern Louisiana junior Brittany Pfantz missed tying the school indoor pole vault record by less than one inch at the LSU Twilight meet Friday in Baton Rouge, La. BATON ROUGE – Together for the first time this season, the Northwestern State women’s 4x400 relay team ran away from the field with a winning 3:48.86 mark that was more than five seconds ahead of the second-fastest time Friday night at the LSU Twilight indoor track and field meet in the Carl Maddox Field House. BATON ROUGE, La. - Sophomore Daniel Mutai ran to a pair of wins Friday to pace the ULM track & field squad at the LSU Twilight at the LSU Field House. Lady Tiger sophomore Denise Hinton set a personal best for the 6th-straight meet on Feb. 17, 2012, at the LSU Twilight as she broke her own school record with a top throw of 68 feet, 3 1/4 inches to win the women's 20-pound weight throw. Hinton's performance moved her into the Top 10 of the NCAA rankings at #8 nationally for the 2012 season.